The measurement of sea level change is much more complicated than most people realize. In fact, the reported changes that alarm so many are minuscule relative to the uncertainties caused by these measurement difficulties. First, consider the easy part: If you drive a stake into the ground at the shore at high tide one day, your task of measuring sea level change will be complicated by the changing day-to-day tides. Those changes will force you to calculate average readings off of your stake over complete lunar cycles (and even that isn’t quite right, since the gravitational pull of the sun matters as well, and the moon’s distance from earth fluctuates). Or, you can make comparisons only between readings one lunar cycle apart. Once the local reference point is established at the shore and the tides are controlled for, there are two kinds of changes that cause the sea to rise or fall relative to the “zero” point on your stake. The sea water can rise or fall, of course, but the land itself might do so as well! Settling or upwelling at the land surface can be caused by a variety of geological phenomena. “Vertical land motion”, up or down, occurs almost everywhere. That means sea level is a relative concept. In addition, over time the placement of on-shore sea-level gauges often change with harbor and ship channel alterations, and even accidents. These all require adjustments in order to make valid comparisons across time. That’s to say nothing of variations in air pressure and water currents, which certainly affect on-shore readings. Today, sea levels are also measured by satellite, but that doesn’t make sea level measurement simpler by any means, as you’ll see below. Kip Hansen discusses the vagaries of sea level measurement in an excellent post. If it isn’t already obvious, changes in readings from a single tide level gauge do not show the rate at which the absolute sea level is changing over time. 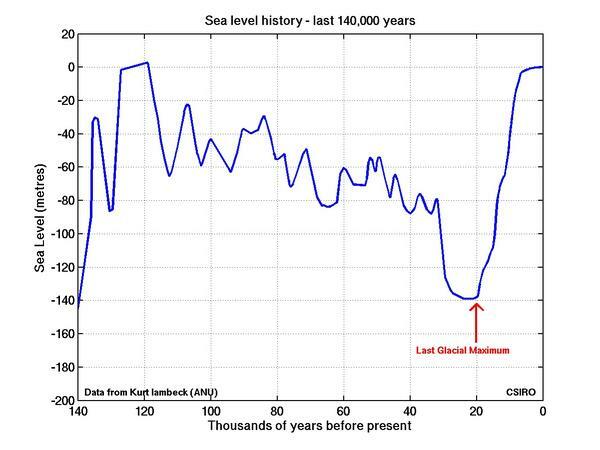 It shows only the local net effect of the absolute sea level change and the land movement. But Hansen emphasizes an implication about which few are aware: a comparison of relative sea level changes in two different locales shows only the difference in “vertical land motion” between the two sites (at least as a first approximation). There are statements on NOAA’s web site that seem to endorse the NASA estimate, but Hansen discounts those references. He advises that there is a big difference between the NOAA science community and its marketing staff, which undoubtedly dominates the content viewed by the public on the site. There are many other factors that play havoc with sea level estimates, some of which are intractable. One issue, which comes up in the comments to Hansen’s article, has to do with sedimentation and its displacement of sea water. While its effect spreads out across the entire ocean, Hansen stops short of calling it a contributor to absolute sea level rise, though that would be the implication in terms of measurement. Alarm over rising sea levels is based partly on the focus of local media on relative sea level changes. That may well be an important local issue, whether the land is settling or the absolute sea level is rising (though the two may have different local policy implications). But local concerns about relative sea level are often translated into global concerns that confuse relative with absolute sea levels. This makes excellent fodder for the propaganda of the leftist climate change movement. That propaganda is so effective that it sometimes feeds back to foment local concern, even in areas experiencing reductions in relative sea level! These concerns fly in the face of local experience as well as the absolute rates of change estimated by NOAA.